Xing and Ding kilns, both situated in Hebei province, made the finest white wares of the Tang dynasty (AD 618–907), and their products are not always easy to distinguish. The present piece has a particularly fine glaze of cream colour, and may have been made by the Ding kilns of Ding county, Hebei province. 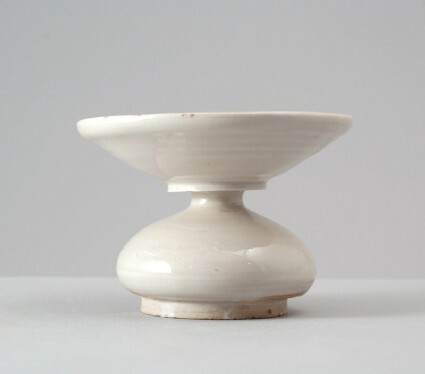 The finely potted piece has a low, broad pear-shaped body, rests on a slightly splayed, unevenly cut foot, and is surmounted by a wide funnel-shaped neck in form of a conical bowl with upturned rim and disc-shaped foot, with a very small opening into the vessel. The near-white stoneware body is covered with a cream-coloured glaze, which ends above the foot, leaving foot, base and the area around it in the biscuit.